Portadown boss Ronnie McFall has received the club's "backing until the end of the season" ahead of Saturday's Premiership game against Crusaders. The support from the Board of Directors follows a four-game run of defeats across all competitions. McFall's contract expires at the end of the season and he will celebrate 29 years as Ports manager in December. Portadown strikers Gary Twigg, Mark McAllister and Darren Murray are injury doubts for the Shamrock Park encounter. The Ports are the only side to have beaten Crusaders in the league this season, a 2-1 win on the opening day. Crusaders are unbeaten in 12 Premierships games but boss Stephen Baxter will be seeking a positive response from his team after Tuesday night's 2-0 defeat by Ballymena United in the Co Antrim Shield quarter-finals. Grant Cameron is on commentary with David Jeffrey for Portadown v Crusaders while Eric White and Philip Major will take you through the action from Cliftonville v Glenavon. We'll have updates from the other games and the latest sporting news while the draw for the Co Antrim Shield semi-finals is at 17:30 GMT. Portadown are also set to be without Sean Mackle, Peter McMahon and Tim Mouncey for the Shamrock Park match because of injury. Linfield overcame Cliftonville in extra-time in their Co Antrim Shield tie and the Blues travel to take on Dungannon Swifts at Stangmore Park. It will be a first game in charge for new Swifts head coach Rodney McAree after Darren Murphy's resignation last weekend. McAree, who takes over a side lying 11th and just four points off the bottom, has midfielder Jamie Glackin back from suspension. "Darren did a magnificent job at Dungannon but Rodney's been there a long time and he understands the club," said Linfield boss David Healy. "I fully expect the Swifts to give us a tough game on Saturday." Cliftonville boss Gerard Lyttle has yet to taste defeat in the league since replacing Tommy Breslin and the Reds face Glenavon at Solitude. "We've got a bit of form, momentum, the boys are flying and we are playing well," said Lyttle. "Hopefully on Saturday it will be the same again and we're fully focused on beating Glenavon." Carrick Rangers entertain Ballymena United with both sides buoyed by midweek Co Antrim Shield victories. 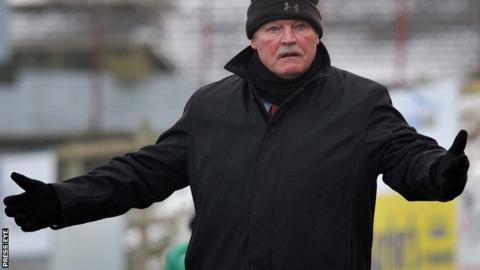 Glentoran are still without a manager ahead of an Oval clash with fourth-placed Coleraine.